This is one of my proudest creations and, I suppose, a good example of a recipe that isn't originally from Italy, but sits uncontroversially in her culinary canon. I don't think it would be too presumptuous to name this linguine ai funghi crudi. It is about as speedy as you can imagine: you do no more to the mushrooms than slice them, steep them in oil, garlic, lemon and thyme and toss them into the hot cooked pasta. If all you can find is regular button mushrooms, this pasta is still worth making - so no excuses. Slice the mushrooms finely, and put in a large bowl with the oil, salt, crushed garlic, lemon juice and zest, and marvellously scented thyme leaves. Cook the pasta according to packet instructions and drain loosely, retaining some water. Quickly put the drained pasta into the bowl with the mushroom mixture. Toss everything together well, then add the chopped parsley, grated cheese and pepper to taste, before tossing again, and eat with joy in your heart. Squeeze the sausage meat from the sausages and roll small cherry-tomato-sized meatballs out of it, putting them onto a plastic wrap-lined baking sheet as you go. Your final tally should be around 40. Heat the oil in a large, heavy pan or flameproof Dutch oven and add the meatballs, frying them until golden; as they become firmer, nudge them up in the pan to make room for the rest, if you can't fit them all in at first. When all the meatballs are in the pan and browned, add the scallions and oregano and stir about gently. Add the wine or vermouth and diced tomatoes, then fill half of one of the empty cans with cold water and tip it into the other empty can, then into the pan. The can-to-can technique is just my way of making sure you rinse out as much of the tomato residue as possible. Put in the bay leaves and let the pan come to a fast simmer. Let cook like this, uncovered, for 20 minutes, until the sauce has thickened slightly and the meatballs are cooked through. Check the sauce for seasoning, adding some salt and pepper, if you like. Once the meatballs are ready, you can eat them immediately or let them stand, off the heat but still on the stove, for 15 minutes. The sauce will thicken up a bit on standing. Should your diners be other than children who balk at green bits, sprinkle with parsley on serving. Reprinted from Nigellissima. Copyright (c) 2012 by Nigella Lawson. Published by Clarkson Potter, a division of Random House LLC. All rights reserved. There are few more welcome sights than a big vat of chilli. The cornbread topping is a glorious golden touch, that everyone can crumble into the spiced meat as they eat, for ballast and crunchy contrast. It makes your life easier and the chilli better if you make the meat up in advance, adding the topping and baking the lot just before you serve. Peel and finely chop the onions; you might want to use the processor here, and if so, add the peeled garlic or mince it by hand. Heat the oil in a very large pan - it has to take everything later - and fry the onion and garlic until they begin to soften. Add the chilli, coriander, cumin and crushed cardamom pods and stir well. Deseed and finely dice the red bell peppers, and tip into the spicy onion. Break up the ground beef into the pan and, using a fork, keep turning it to separate it as the meat browns. It's hard to brown quite so much meat, so just do the best you can. Add the diced tomatoes, kidney beans, ketchup, puree and water, stirring to make a rich red sauce. When the chilli starts to boil, sprinkle over the cocoa and stir it in. Simmer partially covered for 1½ hours. At this point you can cool and freeze the chilli, or just keep it in the fridge - or a cool place - overnight. Preheat the oven to gas mark 7/425ºF. Tip the chilli into a large, wide dish or keep in the pan that is ovenproof. Combine the salt, cornmeal, flour, baking powder and cinnamon in a bowl. Whisk together the buttermilk, eggs, honey and oil in a jug, and then stir into the dry ingredients, mixing to make a vivid yellow batter. Pour the cornmeal topping over the chilli con carne, or blob it over to cover the top as evenly as possible. Don't worry if some of the chilli seeps through as this won't matter one tiny bit. Sprinkle the cheese over the top of the cornbread and then bake in the oven for 30 minutes or until the cornbread topping is risen and golden and the chilli underneath is bubbling. How long this precisely takes depends on how cold or hot the chilli was when it went into the oven. Since it's such a huge vat, you may find it simpler to reheat it on the stove in its pan, before it gets its topping, to start with. And alongside this chilli, as with the vegetarian chilli overleaf, you should dollop out an un-chillied guacamole, some cool sour cream and a mounded pile of strong grated Cheddar. So, mash the ripe avocados with the finely chopped scallions and add the lime juice and some salt to taste. Stir in most of the chopped coriander and turn into two bowls, sprinkling each with the remaining coriander. This recipe is featured in Nigella Lawson's "Feast," Available at Amazon and other bookstores. Featured in: Laurie Colwin: A Confidante In The Kitchen. Heat oven to 350 degrees. In a large mixing bowl, combine mustard, garlic, thyme, cinnamon, a pinch of salt and 1/2 teaspoon black pepper. Place bread crumbs in another large bowl. Working in batches, coat chicken quarters on all sides with mustard mixture. 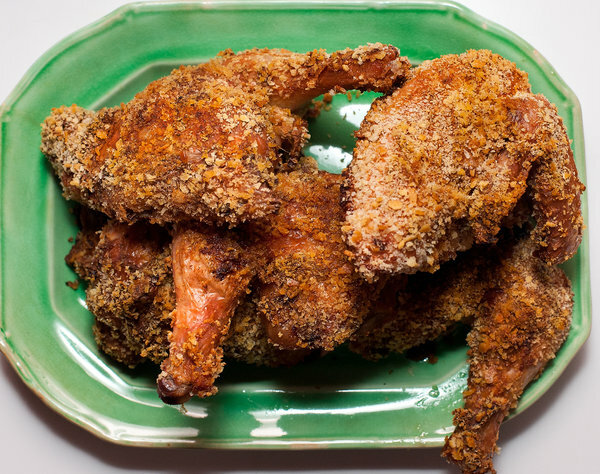 Shake off excess mustard, then coat completely with bread crumbs. Arrange in a single layer in a large, shallow baking pan. Dust the chicken with paprika and scatter butter pieces on top. Bake until crust is deep golden brown and crispy, about 2 hours. (Depending on the oven, the size of the pan and the size of the chickens, baking time may be as long as 2 1/2 hours.) Serve hot or at room temperature. Even though I do give instructions below as to how to make these into one big Red Velvet Cake, I like them so much more as cupcakes. Yes, they do use food colouring - and I advise the paste rather than the liquid, as you need less of it to get the requisite ruby hue - but this is one time I don’t let this trouble me. Food colouring pastes can be found in baking supply shops and online, and then you are ready to make a batch of these deliciously pretty babies. If you want to make this as one big cake then know that the amounts below make enough batter for 2 x 25cm / 10 inch cake tins filled not too deep, and enough icing to squidge them together and decorate the top. Combine the flour, cocoa, baking powder and baking soda in a bowl. In another bowl, cream the butter and sugar, beating well, and when you have a soft, pale mixture beat in the food colouring - yes all of it - and the vanilla. Finally beat in the buttermilk and the vinegar and divide this extraordinary batter between the 24 cases. Bake in the oven for about 20 minutes by which time the redcurrant-sorbet-coloured batter will have morphed into a more sombre, but still juicily tinted, sponge - more maroon acrylic than red velvet, to be honest. Put the confectioners' sugar into a processor and whizz to remove lumps. Make ahead note: The cupcakes can be baked 2 days ahead and stored, un-iced, layered with baking parchment in airtight containers. The frosting can be made 1 day ahead: cover with clingfilm and refrigerate; remove from fridge 1-2 hours before needed to allow to come to room temperature then beat briefly before using. Best iced and eaten on same day but iced cupcakes can be kept in fridge in airtight container for up to 1 day. Bring to room temperature before serving. Freeze note: Un-iced cupcakes can be frozen, layered with baking parchment, in airtight containers for up to 2 months. Defrost for 3-4 hours on a wire rack at room temperature. Frosting can be frozen separately in airtight container for up to 3 months; defrost overnight in fridge then bring to room temperature and beat briefly before use.